Forget What Did: There are moments in the film where he ISN'T clutching her arm. These are not two of them. There are moments in the film where he ISN'T clutching her arm. These are not two of them. ...and this is the movie. 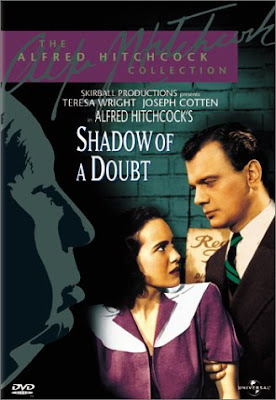 I didn't even consider this flick, but Shadow of a Doubt is one of my favorite B&W Hitchcock movies. 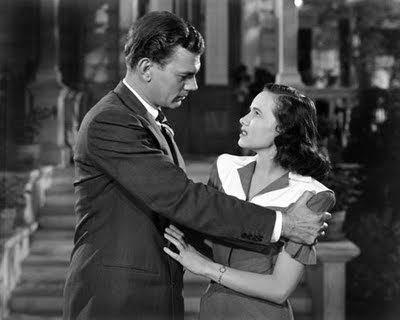 Joseph Cotten, who I associate more with regular-guy types, gets more demented and creepy as the movie goes on. More mysteries could benefit from tension-filled visits to the library. Your drawing still reminds me of William Powell, or perhaps another actor with a stronger chin whose name I'm blanking on. I'm kicking myself now because I nearly suggested The Third Man, which would have made me 50% correct on the actors-who-inspired-them front. 66% correct if you consider that the moustache is clearly stolen from Trevor Howard. I love this game. Not so much as a game, but as a narrative device. Its complete impossibilty is beguiling. I've also just heard your Douglas impression in Cabin Pressure. That was also very, very pleasing. Great. Riffle, re: the library scene: absolutely! I also enjoyed the three most half-arsed murder attempts in the history of cinema that follow it. James: You are definitely the closest thing we have to a winner, or could ever have given the impossibility Simon correctly points out. Next time, as I say, I'll do it properly.